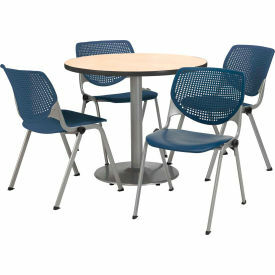 Contemporary and Comfortable Breakroom/Cafeteria Furniture - Table & 4 chair set. 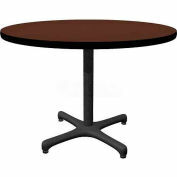 The 42" Round table is 1.25" thick with a High Pressure Laminate surface and T-Mold edge. The base is made of durable cast iron. The column is 16 Gauge steel with a 3" diameter. Leveling glides for stability on uneven floors. 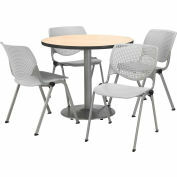 The chair is has an "easy to clean" polypropylene seat and back. The ergonomic perforated back allows for enhanced circulation, while the radius conforms to your back for maximum comfort. 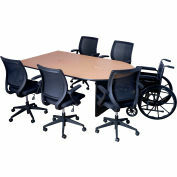 The chair offers a contoured extra wide seat pan and a 400 lb. 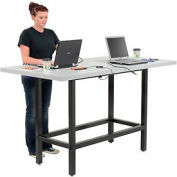 weight capacity to provide comfort and accommodate all sizes. 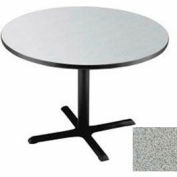 The oval frame is made of 15 gauge steel with silver powder-coat. 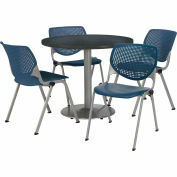 The 2300 is one of most complete stack chairs on the market. It's just plain....KOOL. 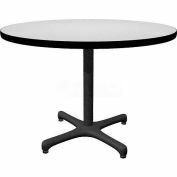 Overall chair dimensions: 21.5" W x 21.25" D x 31" H. Tables shipped unassembled. Chairs shipped assembled, CAL 117 certified, 12 Year Limited Warranty.